The plethora of modern interpretations of the SUV hasn’t stopped the original models of cars fitting that description doing what they do best. The latest example, reports John Challen, is the Jeep Wrangler. 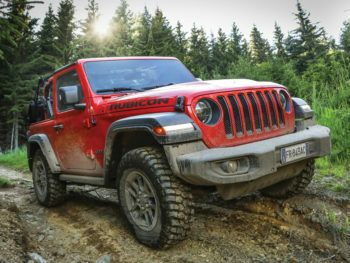 The Wrangler gets two new engines – the 2.2-litre MultiJet II diesel and a 2.0-litre inline four-cylinder gasoline unit. The diesel delivers 200hp at 3,500rpm and maximum torque of 450Nm at 2,000rpm and features a new emissions management system that helps to boost engine responsiveness. Choosing the 2.0-litre gasoline engine gives drivers 272hp and 400Nm at 3,000rpm. All Wranglers will be equipped with an eight-speed auto ’box that claims to optimise engine output and power delivery both on- and off-road. Keen to show that it can move the with time – and trends – Jeep has equipped the new Wrangler with a host of technology to aid safety, communications and connectivity. In comes blind-spot monitoring, ‘rear cross path detection’, front and rear park assist, reversing camera and electronic roll mitigation technology. Touchscreen technology features in the cabin, in the form of a 7.0-inch or 8.4-inch screen that is compatible with both Android Auto and Apple’s CarPlay. The larger screen features the largest and latest Uconnect screen, which is faster and offers higher-resolution graphics. Some Wrangler customers will obviously take their new addition away from the smooth tarmac of highways and byways, but the fact remains that many off-roaders don’t actually go ‘off-road’. As such, the new Jeep has “a modern design that retains all the authentic styling cues of the iconic Wrangler” but also adds a big dose of creature comforts inside. The manufacturer claims it offers “excellent levels of comfort and superior driving dynamics”, which is what most drivers are now used to, regardless of the vehicle. There are more than 180 accessories available to buyers to increase Wrangler customisation possibilities.